"Chaos. War. Death. This is what I see." As a pre-teen boy in the late '80s, I grew attached to a series of novels set in the fantasy world of Krynn. They were called the Dragonlance Chronicles trilogy, and they spawned countless sequels and spin-offs during the next two decades. The original books offered an engaging journey that appeared perfect for the movie world. Last year, I decided to revisit these books to see if they still worked for an adult. One revelation was the often-simple dialogue and some awkward character interactions, but the central journey remained interesting. When I learned recently that an animated movie version of the first novel was soon to be released, my expectations were high for the material. Sadly, this low-budget cartoon falls well short and delivers a frustrating, disastrous adaptation of the enjoyable novel. Dragons of Autumn Twilight tells the story of nine companions who become involved by chance in pivotal events that shape the battle between good and evil. After lying dormant for hundreds of years, the evil goddess Takhisis has returned to Krynn and plans to enslave the world. Humanity's chances appear bleak, but the appearance of a blue crystal staff of healing brings hope that all is not lost. The story begins with a reunion at an inn between friends that have been apart for five years. The key figures in this group are the leader Tanis Half-Elven (Michael Rosenbaum), who struggles to balance his human and elven sides, and Raistlin Majere (Kiefer Sutherland)—a powerful young wizard who may be headed towards evil. During this night, they meet Goldmoon (Lucy Lawless), who bears the staff, and their fates become entwined. Fleeing for their lives, the group begins a journey seeking the truth about the "gods of light." The adventure will not be easy and may involve battles with massive dragons, but it could lead to Krynn's salvation. 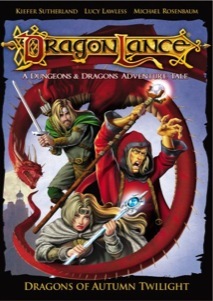 The Dragonlance novels may not be on par with Tolkien's The Lord of the Rings, but they do offer a complex world with numerous characters and locales. It�s frustrating to see this wide-reaching story condensed into a fast-moving, 90-minute mess. The characters have no time to breathe and must jump from place to place with few moments of interest. The novel's sloppy dialogue needed an upgrade, but Screenwriter George Strayton (Xena: Warrior Princess) pulls lines directly from the books that don�t work. Instead of removing lengthy conversations that aren't needed, he keeps those scenes and excises some of the most cinematic moments. The source material retains the mystery of the existence of dragons from the heroes, and the first appearance of the black dragon Onyx (Juliette Clair) is a stunning moment. In the film, her grandeur never gets its due, and the companions treat her like a simple obstacle. It's amazing to see how awkwardly they recreated this pivotal sequence. The same problem occurs during the action-packed finale, which never feels like an actual battle and contains zero tension. There is a laundry list of problems in the screenplay that completely ruin the pacing. This sad version doesn't sell the book's expansive scope and makes it feel like a below-average kids' movie. Director Will Meugniot (Ultimate Avengers II) has considerable experience with animation, but his experimental mixture of two-dimensional footage and CGI is extremely inconsistent. The animation was reportedly outsourced to studios in India and Korea, which contributes to the incompatible characters and environments. The companions walk like stilted figures from Saturday morning cartoons, and their facial expressions don't look realistic. Alternatively, the dragons and draconians are created in CGI and seem out of place in the flat world. There are a few positives within the mess, particularly Kiefer Sutherland�s voice work as Raistlin. The wizard's development towards a power-hungry individual doesn't receive any focus here, but Sutherland does bring weight to his foreboding statements. Lucy Lawless also does well as Goldmoon, though her relationship with her love Riverwind (Phil LaMarr) isn't fully developed. As a whole, there's little to recommend within Dragons of Autumn Twilight and it fails on nearly every level. It's saddening to witness such a lame adaptation of fantasy material with so much movie potential. Image Transfer Review: Dragons of Autumn Twilight incorporates a 1.85:1 anamorphic widescreen transfer that presents the inconsistent animation suitably. There are a few memorable shots of computer-animated dragons and other creatures, but the overall visual style is basically forgettable. The CGI animation often looks unfinished, which adds to the haphazard tone of the entire production. Audio Transfer Review: This release offers a 5.1-channel Dolby Digital transfer that is fairly muted but generally solid. The music and sound effects jump well from the front speakers, but the complexity is lacking, which lessens the overall experience. There are plenty of opportunities for strong audio within this feature, and it succeeds for the most part, but could have been better. This disc also includes a 2.0-channel Dolby Surround track that delivers an average presentation. I had hoped for so much more from the film version of a novel that I enjoyed so much as a kid. The simplistic cover art and the lack of any significant extras gave warning signs this might be a disaster, and those indications were correct. Dragons of Autumn Twilight could inspire an outstanding picture, but this tiresome version doesn't even come close to approaching that standard.